SANDY LEVEL, Va. – At a ceremony at Smith Mountain Dam Nov. 1, Appalachian Power renamed its recently remodeled visitors center in honor of former company president and Stuart, Va., native Joseph H. Vipperman. The company recently completed a significant renovation of the facility. 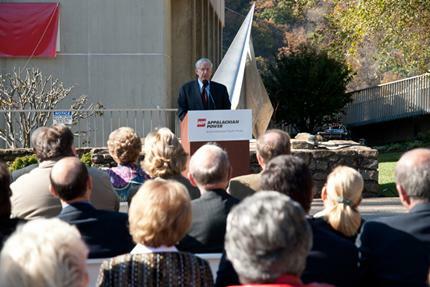 Retired Appalachian Power President Joe Vipperman speaks at the visitors center dedication. 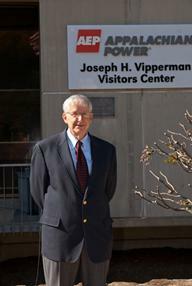 Vipperman spent his entire career at Appalachian Power and parent company American Electric Power (AEP), with the exception of his military service. He served as Appalachian Power president and chief executive officer. In 2002, he retired as AEP executive vice president, Shared Services, after 40 years of distinguished service. He lives in Moneta, Va., on the shoreline of Smith Mountain Lake, with his wife, Pat. The center sits above the massive hydroelectric dam on the north side of the gap of Smith Mountain. The visitors center opened in 1967, shortly after the Smith Mountain Project was complete. “The center has seen thousands of visitors every year since it opened,” said Jeff LaFleur, Appalachian Power vice president – Generation. “School children delight in the 3-D topographical map that shows the lake and nearby communities; the video of construction of the dam, called “The River That Runs Uphill;” and the models that demonstrate the pumped storage concept. The Vipperman Center is open Tuesday through Saturday each week, from 9 a.m. until 5 p.m. Exhibits and the overlook area close at 4:30 p.m. There is no admission charge. Visitors can follow signs from Route 40 to “Smith Mountain Dam.” The picnic area located below the Smith Mountain Dam on Leesville Lake is open to the public every day of the week. Joe Vipperman at the newly dedicated Joseph H. Vipperman Visitors Center. Smith Mountain Project is a 636-megawatt pumped storage hydroelectric facility that utilizes an upper reservoir (Smith Mountain Lake) and a lower reservoir (Leesville Lake). Water stored in Smith Mountain Lake first passes through turbine-generators in the powerhouse to produce electricity and is discharged into Leesville Lake. Most of the water is retained in Leesville Lake and pumped back into the Smith Mountain Lake for re-use. A portion of the water goes through the turbine-generators at the Leesville powerhouse to generate additional electricity and to meet the minimum discharge requirements of the project’s operating license. I am proud to say that I worked @ APCO when Joe was president during my 40 years of service. I am glad that AEP named the SML visitor’s center after him.